Time Boiler is both a tale of time travel memory loss told in tape collage music and a series of attempts at time compression through musical trials on the performing body. In this program, G Lucas Crane will be tasked with specific times in which to tell each part of the story, cooking down time itself into a series of dense atmospheric collages set to otherworldly video pieces. He will reveal the lost tapes of prophecy and use these mutant tapes of yore to succeed in the trials of the Time Boiler. This performance will illustrate the psychological consequences of time travel on the human mind through a series of live compositions constructed from the depths of his cassette tape archive of ancient sound memories collaged together in the style of an apocalypse DJ. Read Crane’s Spotlight Q+A with Roulette here. G Lucas Crane is a sound artist, performer, and musician whose work focuses on information anxiety, media confusion, sonic mind control and time skullduggery. 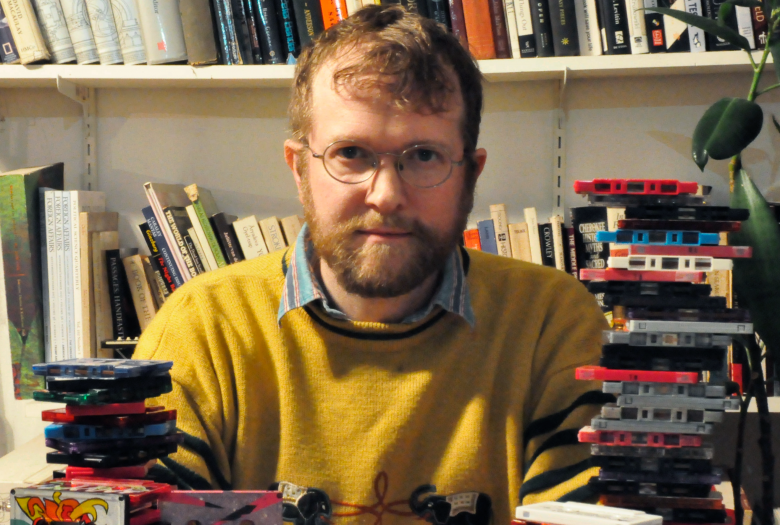 His cassette tape based sound practice explores the liminal space of hybrid analogue aesthetics and new performance techniques for forgotten technology. In New York City, he has variously performed at The Stone, Museum of Art and Design, Pioneer Works, Roulette, Issue Project Room and the Brooklyn Museum. He was a 2011 LMCC Swing Space Resident Artist and received the NYSCA Individual Artist Commission for the sound design of theater piece This Was The End, for which he received a Henry Hewes Award and a Bessie nomination. He is a co-founder of the (hold that thought) Silent Barn, an experimental art and performance space in Bushwick, Brooklyn. His current project, Decoder 2017, a collaboration with director Mallory Catlett, plays at the Chocolate Factory Theater in 2019. This performance is made possible with support from mediaThe foundation, and with funds from GENERATE. G. Lucas Crane from Roulette Intermedium on Vimeo.